U+B wins two FAB Awards from the International Interior Design Association! 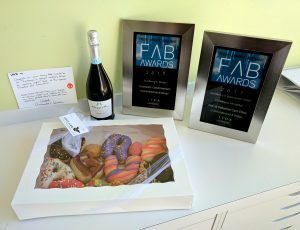 – U+B architecture & design, inc.
U+B wins two FAB Awards from the International Interior Design Association! Home » Awards » U+B wins two FAB Awards from the International Interior Design Association! Both our Corporate Condominium and the Kiran Stordalen & Horst Rechelbacher Pediatric Pain, Palliative & Integrative Medicine Clinic were recipients of this industry award! Congratulations to our team of talented architects and designers.